The Amish American Mission Swivel Barstool provides comfortable seating for your bar area or pub table. This barstool features our best selling Mission styling and comes in your choice of height, hardwood variety and finish. 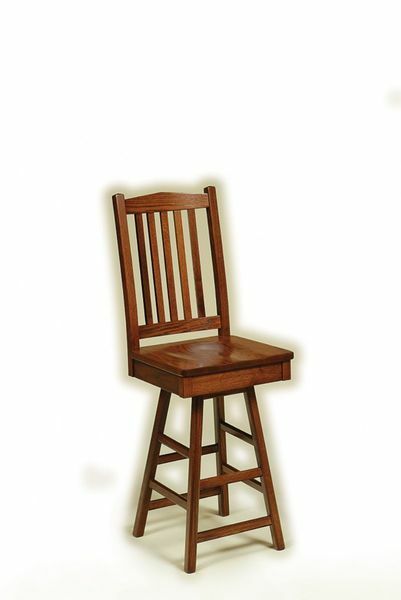 Popular in the United States since the late 1800s, mission style furniture keeps it simple, highlighting the superior craftsmanship of each barstool with its simple design that is built exceptionally well. Enjoy a lively game night around your pub table with these Mission Swivel Barstools to seat you. Shown here in quarter sawn white oak wood with a Michael's cherry stain. Quarter sawn white oak displays beautiful irregular markings or flakes that come from the unique way the oak log is cut, resulting in a distinguished character and unique appeal. Explore our collection of Amish Home Bars to create an entertaining display in your home. Check out another great Mission style barstool from the Leola Collection for another seating option. Customize with your selected stool height, wood choice and stain. Call one of our Amish Furniture Specialists today, toll-free at 866-272-6773 with any questions or visit our DutchCrafters Furniture Store in Sarasota, Florida to experience our furniture firsthand.